We invite all children at ages 6-12 and their parents! We invite all children at ages 8-14 and their parents! Electric Castle Festival is the biggest Romanian music festival. It takes place annually on the Bánffy Castle domain in Cluj County, Romania. The festival tries to offer a full experience to the participants by creating a mix between the unique location, filled with beauty and history, daylong urban activities (like extreme sports, audio-video production workshops) and a large variety of music. This year Hackidemia will be part of this mix and together with our friends from Cluj Makers we want to build digital and physical experiences based on curiosity and interest to explore the magic of sound. During 3 days we will make music hacks and instruments using recycled materials, Makey Makey and objects around us. Come visit our music playground, play electric fruits and make instruments and music by juggling with us. This Saturday afternoon at the booth of makeup, Eilenriedehalle, Stand 64, during MakerFaire Hannover we will organize a workshops for kids (9-14 years old). Participants will learn how to create little houses, toys, animals that light up and have different personalities by using a variety of materials like paper, glue, conductive tape and thread, LEDs, sensors and batteries. Once they designed and created their toy, construction or animal they will learn how to make them interact with each other. Materials : conductive tape, paper, batteries, LED, Arduino, speakers, light sensor, touch sensor, buttons, scissors, colors and glue. It's spring - time for hacking! Our next Kinder Hackathon will take place on April 18th 2015 at Paul-Lincke-Ufer 39/40 Berlin. We are looking forward to see you there. If you are interested in becoming a mentor for the event please register here. As part of the Singapore Science Centre's effort to promote STEM education, the HacKIDemia community has been invited to set-up booth at Junyuan Secondary School during the Bursary awards ceremony to introduce students to making simple, yet cool and fun things with technology and art. The booth with Bristlebots and LED circuits will be side by side with paper art(quilling), zoetrope, 3d printing and gravity marbles stations. Saint George is a small city with people with big ideas located right in the center of Romania. HacKIDemia is coming here for a-3 hours workshop with 6+ year old kids to be part of Stimmul's December Delight event series. Our workshops start at 13:00 and will be followed by a massive geek-out demo of gadgets and new technologies. For more information visit our Facebook event. HacKIDemia is back again in Singapore for this holiday season and we'll be running four sessions of it - on 13th, 14th and 20th December. We will organize first training for mentors in Shenzen. For the first time we are organizing a full Hackidemia event in Plovdiv, the second biggest city in Bulgaria. The event will be hosted by Hackafe and is sponsored by Olimex. Hackafe is the first hackerspace in Plovdiv and have grown to be the hub of innovation in the city. Olimex Olimex is Plovdiv based hardware and software company. They are building open-source hardware, based on Arduino, ARM and other technologies. Playing "Simon says" on pre-soldered equipemnt, with the chance of solder one themselves, if the age allows. Building a sensor station, which measures the quality of the air in terms of temperature, humidity and pollution. Also deploying the station on air balloon high above the buildings. Understanding how our heart beats and how we can control the color and intensity of an LED only with the flick of our muscles. Playing a peculiar instrument, made out of thin air. Visualizing how the IR sensors work and how to control music only with hands. Drawing with colorful LEDs and making a scrolling and moving animations directly on a screen of LEDs. Social innovation ideas are great – but they won´t have an impact if they are not tested, measured, re-developed, tested again, further refined and then finally implemented. Together with HacKIDemia we would therefore like to invite our Peace Innovation Lab Community and Berliners alike to come along, share, develop and build their ideas, which can make Berlin a better place to call home! We will start the morning by hearing inspiring stories from experienced social innovators before we start forming working groups to build new concepts. * Participation is free, but please bring money for drinks and lunch. ** Please bring weather appropriate clothes, as we will be spending most of the day outside or in the Maker Lab. - 3 lessons learned ... founding Alma Sana Inc.
designs workshops and kits that help kids use curiosity, empathy, and play to change the world. Learning by doing and by playing comes natural to children as they have an innate curiosity. Hackidemia´s hands-on workshops encourage and develop that curiosity and give kids the tools to transform their dreams into reality. 15 Makers spending 1 month in Berlin to design and build a makerspace in a container! We're organizing the first MakerCamp for mentors, makers and designers that want to dive deeper in their projects and be surrounded by a group of super curious and multi-skilled people. We will not only develop and play with the HacKIDemia Maker box but actually create a whole maker space in a box (in our case a container). Participants will be able to create and play with an actual physical space for makers and run workshops and demos for local community in Berlin. The camp will be running at the same time with the Hardware.co accelerator so we're hoping that our makers will learn how to build sustainable projects for the hardware start-up teams. We will also have a great team of mentors that have proved that maker projects can become professional and have a real impact. Demo of the First-ever MakerCamp in Berlin with the first-ever Maker Space in a container to be build in Europe! Makers from around the globe came together for the whole month of August to design and build a #Makerspace in a sea-freight #container on #Factory Campus in Berlin. The camp participants are sharing one vision of creating physical projects for solving problems in their local communities (e.g. energy consumption monitoring, 3D scanning solution for repairs, battery charging solutions and much more). All projects will be presented to a selected crowd of maker enthusiasts on Wednesday, 27 August from 18:00-20:00. Participation by invitation only - send an email to Franziska@hackidemia.com should you be interested to join and support the Demo Day and the MakerCamp project! HacKIDemia MakerCamp are celebrating the opening of their sea freight MakerSpace on the 8th of August! HacKIDemia is hosting a MakerParty at Factory Berlin to showcase some of the MakerSpace projects, to use new technologies, to exchange knowledge and to create new answers to new problems. This is a fundraising event for our maker camp so please understand that we cannot offer guest list spots. Entrance to the party is included in the Maker Day ticket; Early Bird tickets for the party are 5 € or 7 € at the door. We will experiment across disciplines: hacking, comedy, music, food, art and installation. We invite all makers, artists, crafters, biohackers, skaters, DJs, curious minds to come and break, make and shake things with us. Check out our line-up of 3D printed food, drone making workshops, arduino workshops and installations, bio-Hacked cocktails, a laser show, fruit DJ-ing, live skating and graffiti here! This week we will be participating in the MLOVE Con Festival hosted in Berlin. The MLOVE ConFestival brings together CEOs, innovators and entrepreneurs from across multiple disciplines to share, learn and cross-pollinate ideas with an array of scientists, artists and other thought leaders. The event exposes the mobile industry to the best minds outside of mobile to maximize the opportunity of creating life-changing services and applications that can impact us all for the better. Our Afrimakers project was invited to the panel called "The New Africa and Empowerment" that will take place on Thursday at 14.00. If you cannot attend you can follow the conversation on twitter: #mlove. Let's inspire and be inspired! Hackidemia Sofia is excited to come again and load kids with some electrifying hacks for the biggest holiday - the 1st of June - Children's Day. Together with the Smart Fab Lab - the first FabLab in Sofia and great support from Transformatori and Sofia Tech Park, we are happy to officially announce the event. As much as we all love soldering, the Paper Electronics workshop will guide the children to create complex circuits without using any soldering but instead by playing with circuit stickers! These are peel-and-stick electronics for crafting circuits - multicolored LEDs, a light sensor, a microphone sensor for detecting sound, a timer circuit that turns on your circuit for five seconds at a time. Also complex sensors like the touch sensor - a Microcontroller Sticker that comes set up to work as a touch sensor, but advanced participants will learn how to program the onboard ATTiny85 microcontroller to do anything they want. We will also play with bio sensors in the DIY Bio Hacking workshop done by Georgi Chipov from ChipoLabs. Georgi is a great part of our local community and will show us how to sense our heartbeat, muscle activity and others. How do computers learn new things? This will be part of the topic in a Machine Learning workshop designed to show children the basic concepts behind an Image Recognition algorithm. The Fabrication Tools Exploration workshop will show the kids how to use different machinery and what can be made with it. We will also explore the unexpected world of wearable devices and design new and creative ways to embed sensors to turn any surface into an interactive experience. During the event we will develop two City Sensor stations that would measure air quality in specific part of the city. 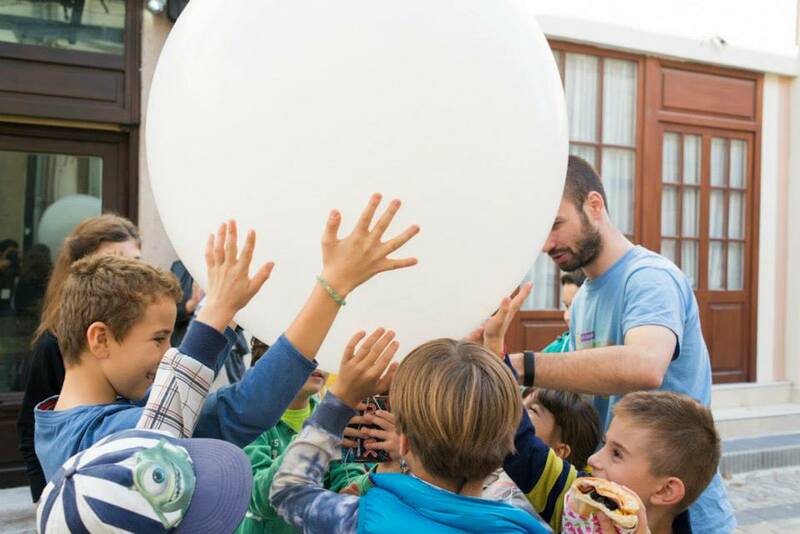 With this workshops we hope to inspire children and adults to be aware of the environment we live in and do as much as they can to preserve it. Transformatori, Sofia, Bulgaria - ul. Hristo Smirnenski 1 - here's the map. We will be presenting HacKIDemia and Afrimakers @Maker faire Bay area this weekend. The idea for AfriMakers was born last year u2013 since then the AfriMakers tour, initiated by HacKIDemia, has kickstarted maker workshops focused on local challenges in 8 hubs around Africa (Kenya, Tanzania, Rwanda, Zambia, Ghana, Nigeria, Egypt, Botswana). Local teams have created air quality monitoring stations, agriculture pest maps, solar chargers, water filters, and mobile laser cutters. AfriMakers team members are going to show case some of the solutions created and discuss why using local know-how and hands-on prototyping for solving local challenges is more effective in creating access to clean water, energy, and information. Hackidemia Sofia is excited to come again and happen with full power on the 17th of May! Together with SOHO Sofia - the Sofia holistic co-working company and our friends from TEDx Bulgaria. 3D Printing with RepRap, Paper Magic with Chibitronics, The digital world around us - Makey Makey will help us turn any surface into an interactive playground! Crafts - constructing objects from wood and Cardboard Creativity and Recycling workshops. Learn Mathematics while playing games with FunMathematics and reverse-engineer the way you breath! We will build 3D Origami and driving a car with lemons. Our challenge will be to learn the very basics of electronics and what we need to light an LED. How the batteries work and why and how we can use a lemon to light an LED. We will have fun making experiments together with the team at Zakachalka. We will learn about the Kaleidoscope Photo Effect with KidsLab@DSLL. Durante 2014, SparkTalents trae a Chile Hackidemia: los talleres que llevan el "DIY" (Hagalo Ud. mismo) y el "Tinkering" a niños y niñas. Comenzando el próximo 26 de Abril, con el primer taller en el Museo Nacional de Historia Natural, de la Quinta Normal. Los talleres son gratuitos con cupos para 40 participantes entre 6 y 16 años. Los talleres se extenderán entre las 10:00 hrs y las 17:00 hrs de la tarde. Este innovador concepto permite que los jóvenes puedan participar en varios talleres durante el día. Las actividades son rotativas durante el día, cada una con una diferente extensión, de esta manera los jóvenes pueden incorporarse durante todo el día a los talleres o concluir el taller antes. Para asegurar el cupo en el taller de tu interés, es recomendable que los participantes lleguen temprano. Los interesados en participar pueden pre-inscribirse en este Link. Are you a maker/techie? Would you like to help us spreading technology in Kenya & and the rest of Africa? Stefania Druga together with Ahmed Bastawy , Saieed, and Abdelaziz from the Afrimakers project will be visiting Kenya on 24 Jan till 1 Feb to train mentors on spreading latest technologies among 7 - 16 year olds in Kenya and ِAfrica. The training workshops will cover Arduino & Raspberry Pi programming as well as some crafts & electronics basics. HacKIDemia bringt ihr Format, sich durch interaktive Mittmach-Workshops gemeinsam mit Technik auseinanderzusetzen, zu den Kindern in Berlin mit Kids Hack the City am Samstag den 30. November 2013. Kostenlos für Kinder ab 5, wurde Kids Hack the City entwickelt, um „den Vorstellungen der Kinder eine Stimme zu geben.“ Warum sind es immer die Erwachsenen, die die Zukunft gestalten, wenn doch die Kinder darin leben müssen? Das ergibt doch überhaupt keinen Sinn! Zum Glück für Berlins jüngste Bewohner hat HacKIDemia einen komplett anderen Ansatz für die Gestaltung der Zukunft – und es fängt alles an mit einem ganzen Tag voller Workshops. Unter anderem können die Teilnehmer lernen wie man Videospiele erschafft, Blumen und Früchte in Schlagzeuge und Keyboards verwandelt, DNA aus Erdbeeren extrahiert und Papier Elektronik kreiert. HacKIDemia ist ein mobiles Erfinder-Labor, das zukünftigen Weltgestaltern Zugang zu einem praktischen Wissenschafts-, Technik-, Kunst-, Ingenieurskunst und Design- Wissen gibt. Dieses Wissen ermöglicht es ihnen, Herausforderungen durch das Entwickeln und Testen von kreativen Lösungen und physikalischen Apparaturen zu meistern. Wir glauben, dass Neugierde, Einfühlungsvermögen und Spielen die Welt verändern können. Why is it always the grown-ups who get to shape the future, when it’s our kids who have to live there? That doesn’t make any sense at all! Lucky for Paris' little ones (and their folks), Hackidemia has a whole different take on architecting tomorrow–and it starts with a full day of hands-on workshops on Wednesday, November 27th at IESA multimédia. Free for children ages 5 and up, Kids Hack the City is designed to “give kids’ imaginations a voice.” Among other offerings, participants can learn how to design video games, turn flowers and fruit into a drum machines and keyboards, extract DNA from strawberries, and create paper electronics. While this event is free and open to the public, a (free!) ticket will be required for entry. Registration: To reserve your spot/s, please register here. Language: Tutors speak French & English, so the language of instruction will depend on the participants, big and small. Cost: A recommended donation of 5-10 Euro is requested to cover the cost of materials. Donation jars will be on the workshop tables. Schedule: The workshops will run continuously between 10:30-14:30. Activities will be drop-in, meaning participants can join in whenever they arrive and leave whenever they’ve had enough fun! Age range: All ages are welcome. Under 5′s must participate with a guardian however. Supervision: Guardians are requested to be in attendance. Why is it always the grown-ups who get to shape the future, when it’s our kids who have to live there? That doesn’t make any sense at all! Lucky for Austin’s little ones (and their folks), Hackidemia has a whole different take on architecting tomorrow–and it starts with a full day of hands-on workshops on Saturday, November 16th at Travis Heights Elementary in Austin, TX.